Because they are gregarious, one rarely sees a lone barklouse. 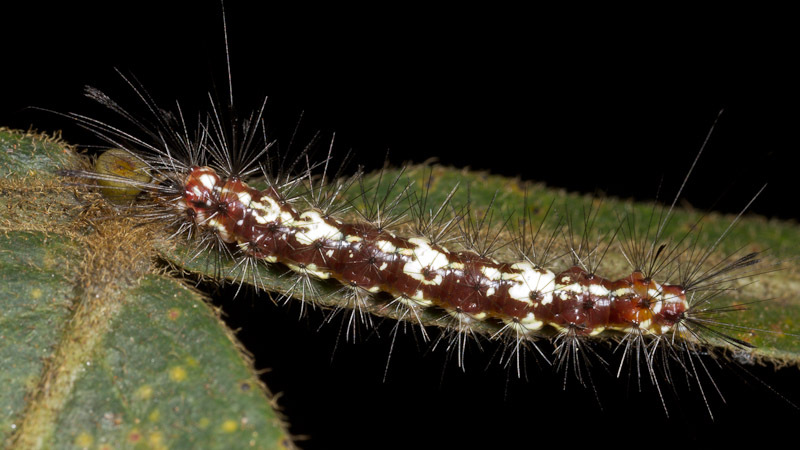 I was surprised to find this one by itself on a leaf. There might have been a group nearby, but I didn’t find them. Elsewhere in the park though, I did find an aggregation. 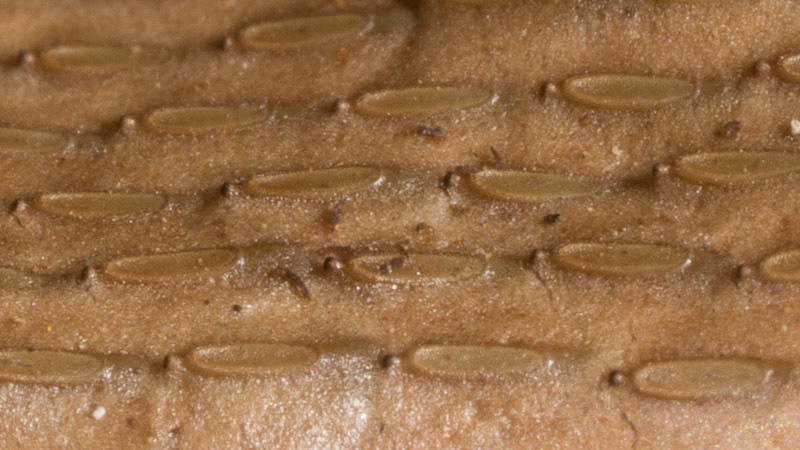 What looks a bit like peanut brittle is presumably an egg mass. 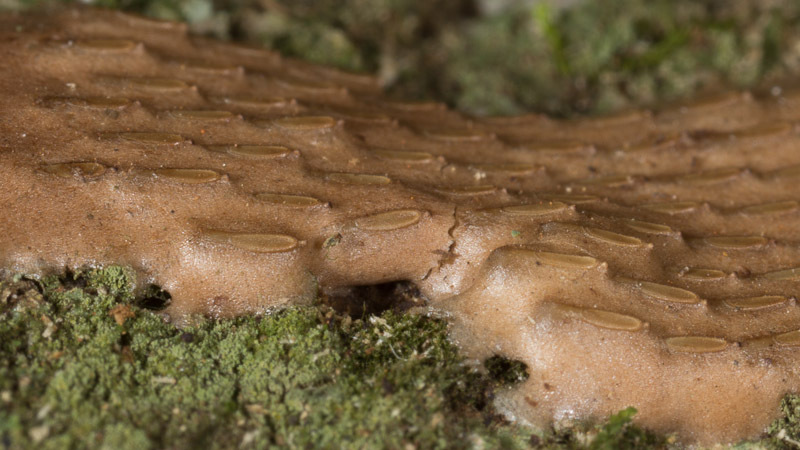 I found this on lichen covered bark at the base of a tree. 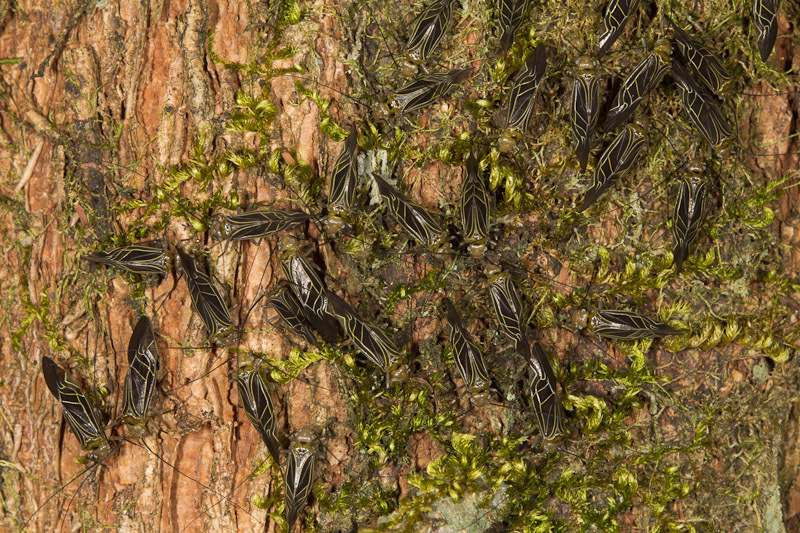 Overall it was about 25mm long, which would make each of the embedded eggs less than 2mm long. Each egg appears to be elliptical, with a sort of knob at the exposed end. This attractive little beetle was resting when I found it. Looking at it here, it almost appears to be nature’s idea of a gaudy holiday light display. Just imagine each of those elytral punctures as a tiny LED, and then imagine them programmed so that the dorsal patterns shift down the eltytra, one puncture at a time. Jokes aside, it actually blends in pretty well with the browning foliage. 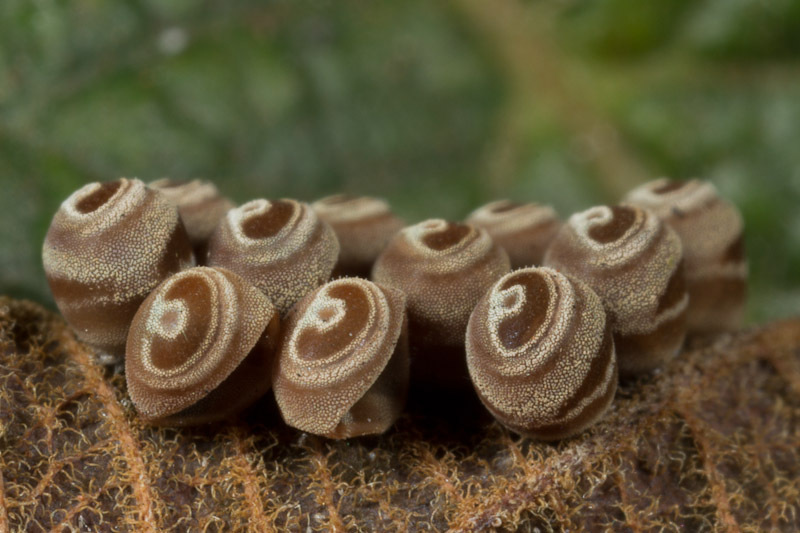 These curiously textured and patterned eggs were placed on a dried leaf tip. I don’t recall ever seeing anything quite like them. 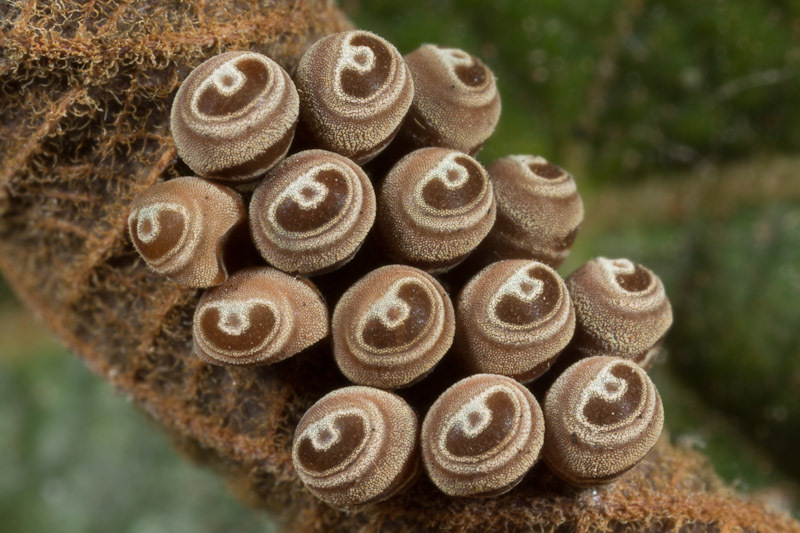 I don’t know what they are, but I’d guess moth eggs. Some of the ones around the edge are a bit crumpled. Here’s a wider view, to give you some context for the placement. 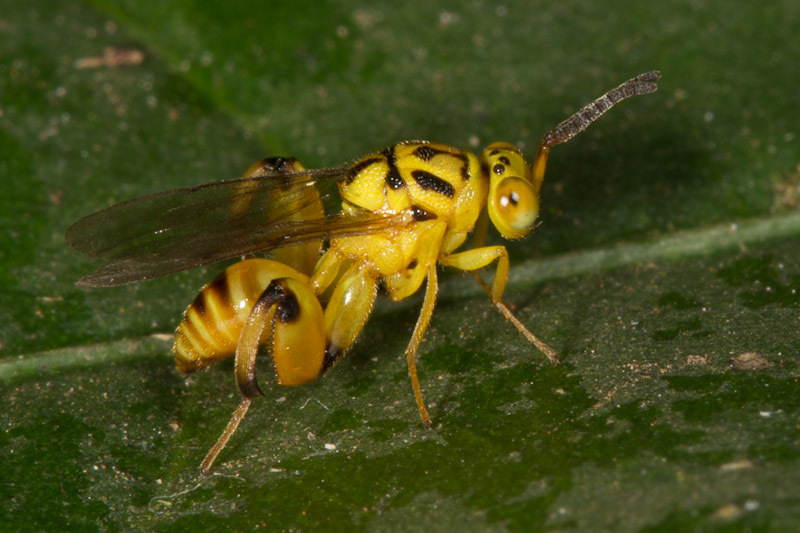 This is the first time I can recall encountering one of these wasps in the field. 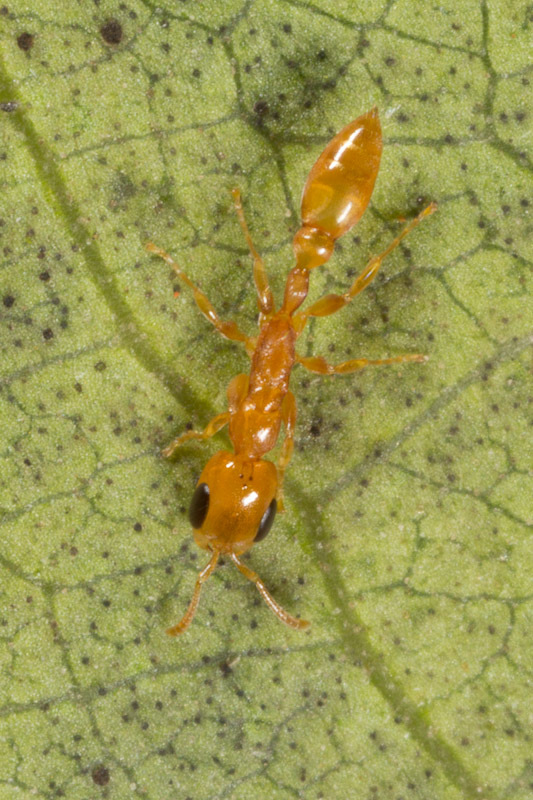 Chalcid wasps are easily recognized by their enlarged hind femora. 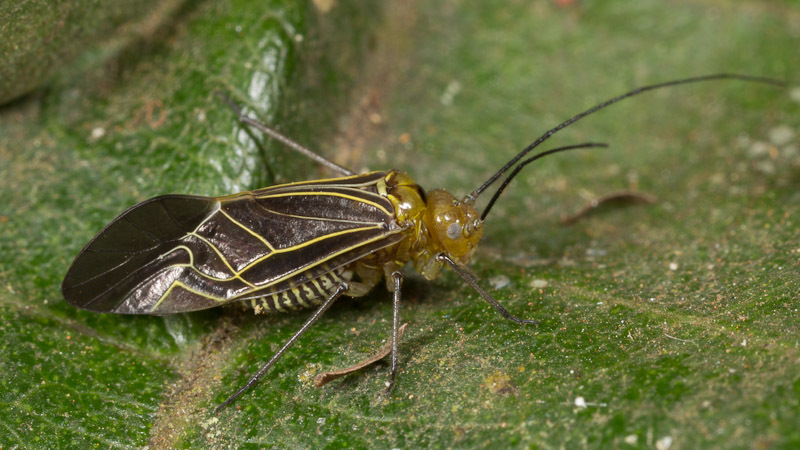 If you missed the one that emerged from a chrysalis I collected, check out this earlier post. 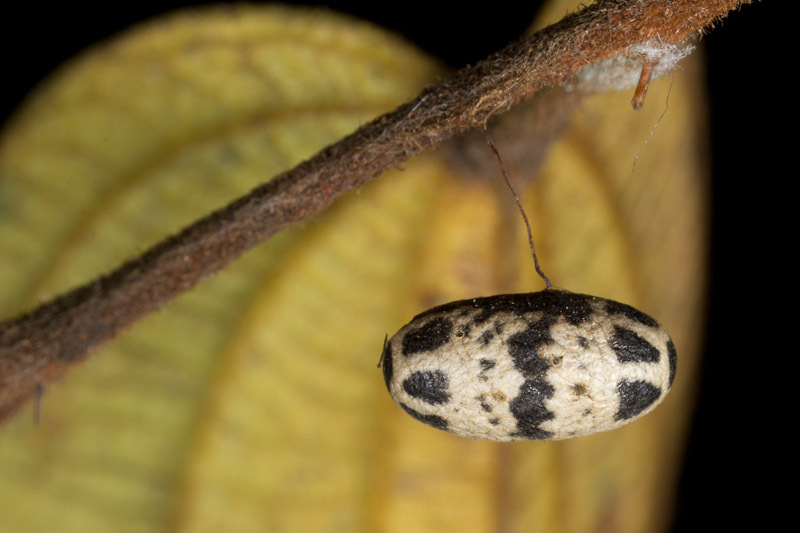 These attractively patterned little cocoons seem to be a common sight no matter where I travel. 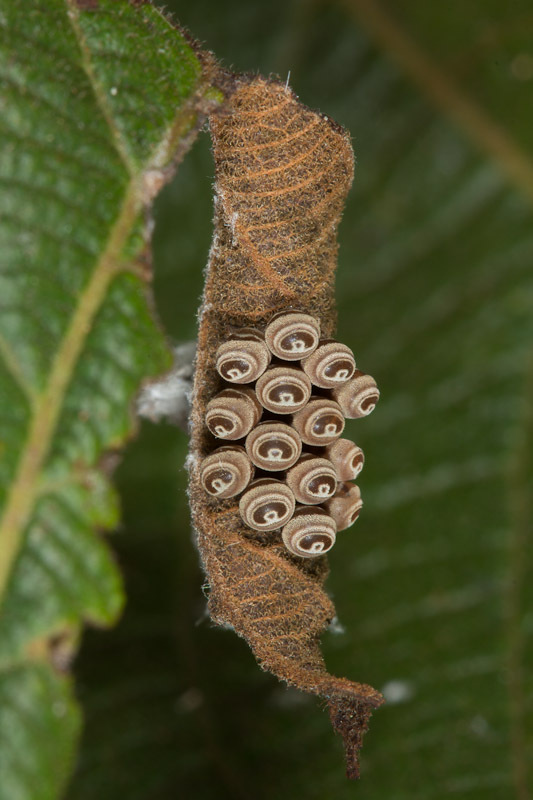 Each one holds the pupa of a parasitic wasp. 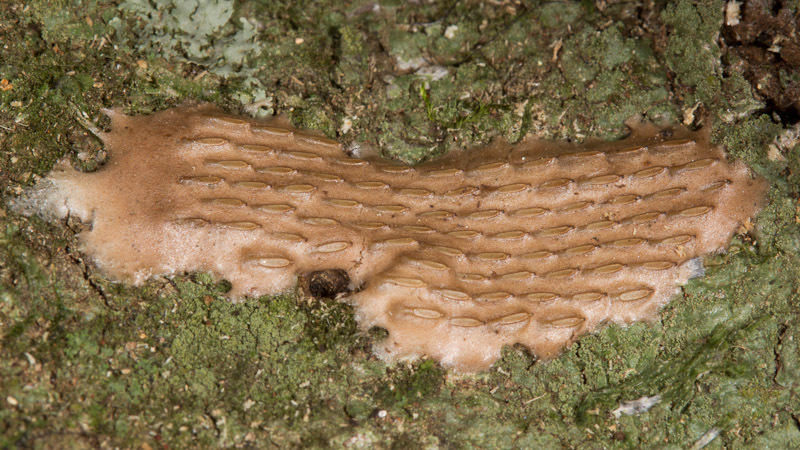 I’ll often find what’s left of a caterpillar host nearby. The ones I notice are usually suspended by a thread, as here. That’s not always the case though. 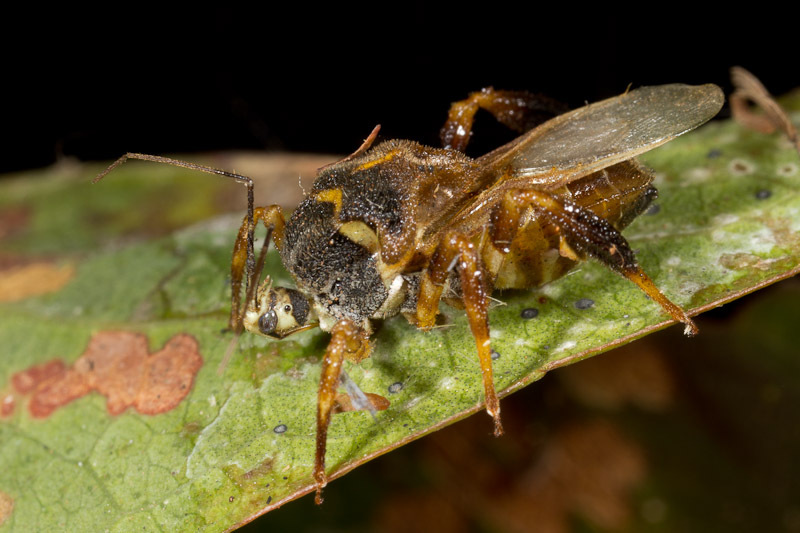 This assassin bug mimics a bee quite well. 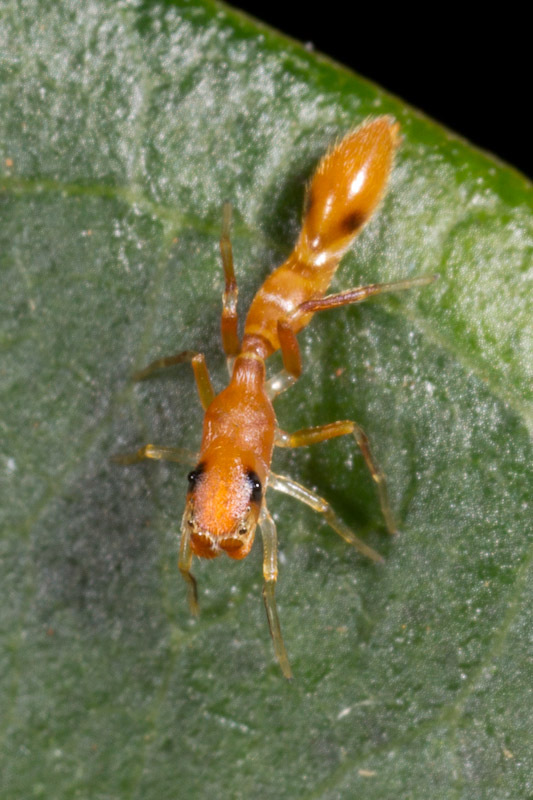 It even seems to have pollen baskets on its hind legs. 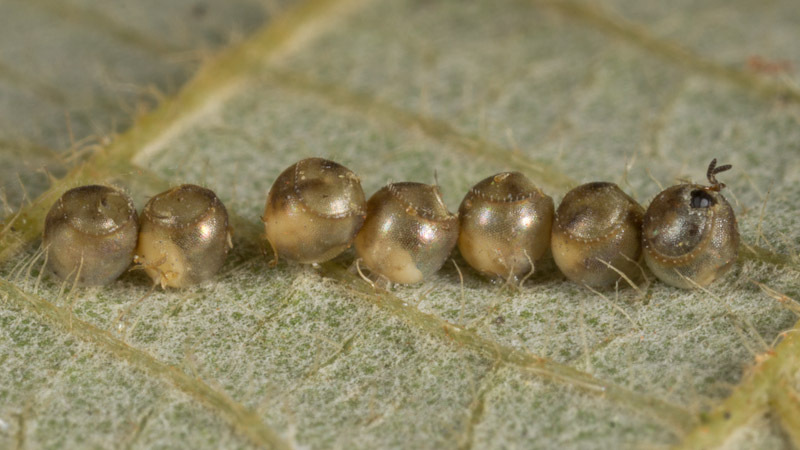 Each one of these eggs from the underside of a leaf was parasitized by a wasp. 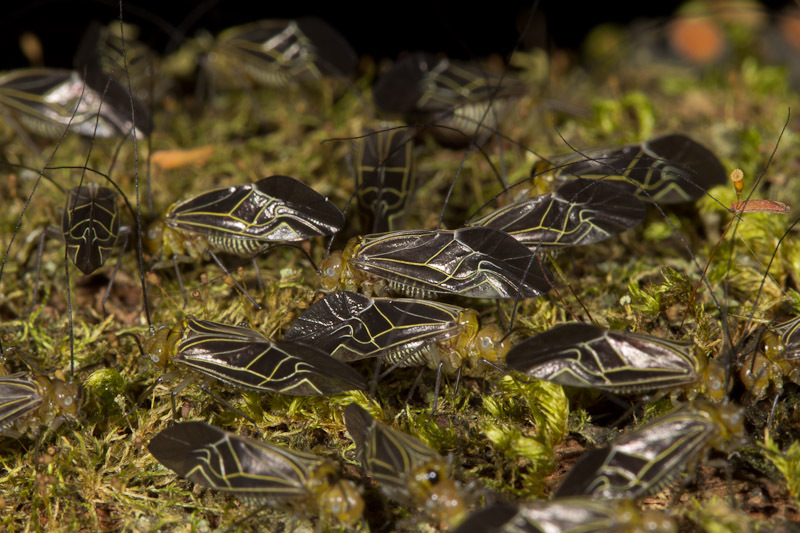 Their barrel shape with round fringed caps suggests they might be stink bug eggs. Had a stink bug nymph emerged, the caps would have been neatly opened. Instead, they each have a roundish hole chewed in them. 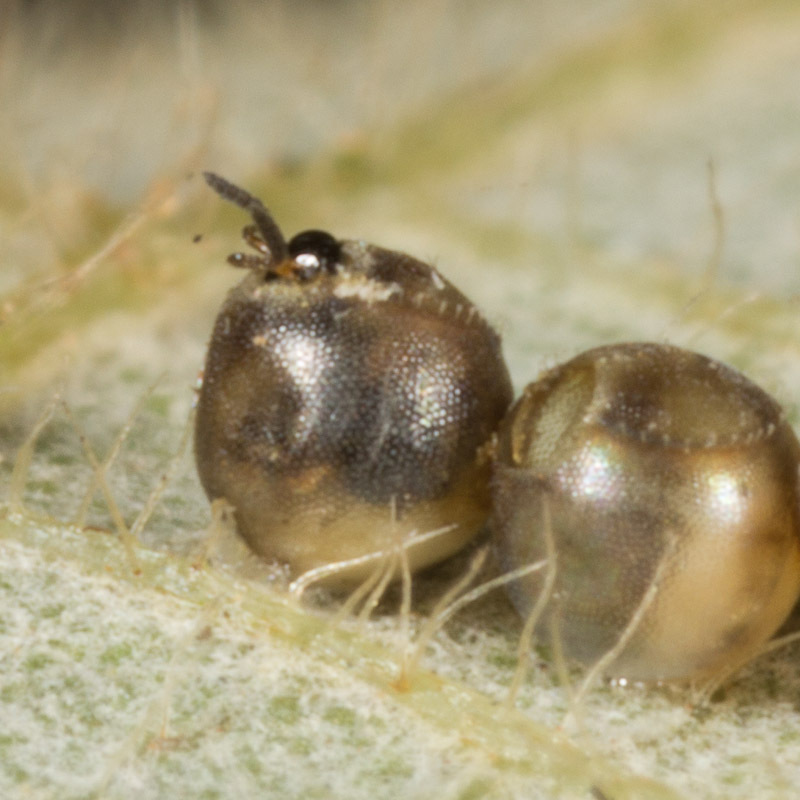 In fact, there’s a parasitoid wasp straggler chewing its way free from the rightmost egg. I might be seeing things, but you can almost make out the wasp’s body through the transparent egg shell. 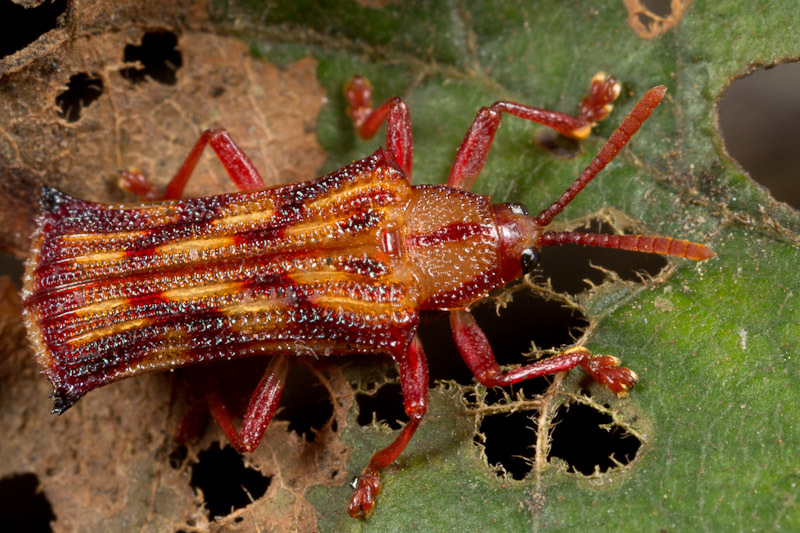 These two photos of critters both 4mm long were taken less than an hour apart in spots just a few feet apart. I believe these two are probably a mimic and its model. I first photographed the jumping spider. I only got a few shots before I lost it. Later I spotted the ant and took quite a few photos. Here I selected one that would show roughly the same pose as the spider. I hope you enjoy taking a closer look at some of the things I find interesting.